ACE’s two D and F series offer optimum solutions for the entire range of vibration damping and for effective reduction of resulting structure-borne noise. The PUR material used in Series D is made to a patented formula and has been developed specially to absorb shock loads. Its very high inner damping makes this product an alternative to hydraulic end position damping, if the mass does not have to be stopped in a precise position and the energy does not have to be absorbed 100%. 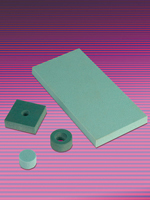 SLAB damping sheets in Series F are used in vibration insulation, e.g. in machine tools and textile machines, hydraulic units or presses and punches, and help to avoid stoppages in the production process and detrimental effects on product quality.